Sever's Disease (Calcaneal Aphophysitis) is not a disease, but a repetitious strain injury common in children between the ages of 8 and 14 years old. It is a common cause of heel pain, particularly in the very active child. 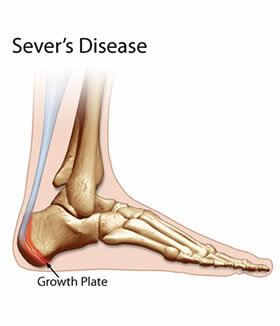 Patients with Sever's disease complain of pain in the bottom surface region of the back of the heel. This is where the growth plate is located, and is not fully developed or calcified in a child's foot. The above causes tension, inflammation and pain where the Achilles tendon inserts onto the calcaneus (Back/bottom surface of the heel bone). It is important that this problem is treated and monitored until the growth plate ossifies in the heel. This could occur between the ages of 14 and 16 years of age. In extreme cases the growth plate can become separated from the calcaneus.